Forum Index > Historical Arms Talk > Migration era sword hilt question. Posted: Wed 01 Dec, 2004 11:26 am Post subject: Migration era sword hilt question. Hello all,I found these pictures on another forum and am very curious as to when they may date from. Anyone have an opinion? 5th century C.E. perhaps? It's hard to say since they're in such bad shape. 5th century wouldn't be a bad guess or the one on the left. If I had to say I'd put a 6th-7th century date on the other two. I would have to agree with Patrick's estimate. 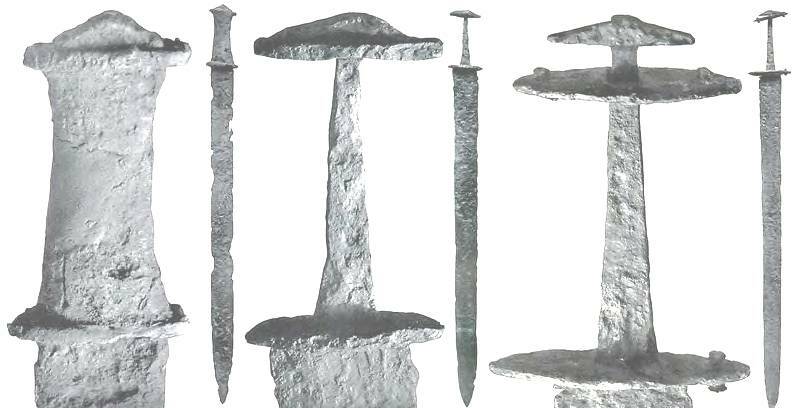 5th century AD for the left, 7th for the right and the middle being somewhere in between.